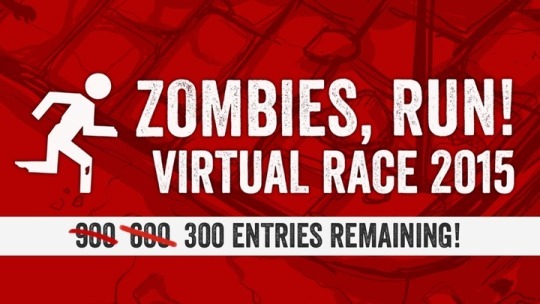 ZR Virtual Race – More Entries Available! – Zombies, Run! ZR Virtual Race – More Entries Available! If you haven’t yet signed up for the first ever Zombies, Run! Virtual Race, never fear. We’ve managed to source an additional 900 race packs, and these are now up for grabs! They’re selling fast though, and there are fewer than 600 300 entries left at the time of writing! This is the final set of race packs available for this race. With the huge demand we’ve had so far, we recommend that you don’t delay if you’re interested! Simply open the news post in the app and you’ll find more info and instructions on how to enter. If you’re still seeing an old version of the news post, you can restart your device to make sure everything is up to date. Next Post Any updates on Zombies, Run coming to the Apple Watch?